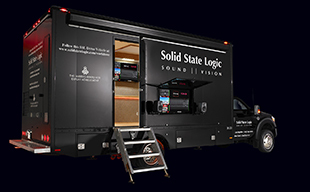 LAS VEGAS, NV  Solid State Logic is pleased to introduce the new, extremely compact 16 fader version of the no-compromise C10 HD Digital Broadcast Console at NAB 2010, on booth C3313 in the new Pro Audio Hall located in the Central Hall at the Las Vegas Convention Centre. The new compact version of the successful C10 HD further reduces the console footprint and price point to appeal to space and budget restricted installations, while delivering all the advanced capabilities and sound quality of the larger C10 HD. The C10 HD is truly the SSL broadcast console for broadcasters of all sizes, providing a self-contained console with no additional processing racks and passive cooling that is ideal for any smaller, quiet space. The C10 HD delivers the superior audio quality, powerful processing tools and advanced ergonomics expected from every SSL console and offers many options to solve the production and workflow challenges of smaller broadcasters upgrading their facilities for HD content production; a Broadcast Production Automation option provides support for Ross and Sony production automation systems, a 5.1 Upmix option generates multichannel surround output from stereo sources and a Dialogue Automix option ensures reliable, multi-mic talk show audio level management. SSLs DAW Control option enables post production mixing during studio dark periods for increased studio productivity. The new Compact C10 HD console offers 16 channel faders and 8 centre section faders in an Eight-Centre-Eight configuration. It has 64 full input channels with EQ and dynamics processing, moving faders and full HD 5.1 surround capabilities. SSLs pioneering Eyeconix feature (offering visual recognition of a channels audio source), joins extensive and refined information screens showing system status, channel routing and metering. The consoles small footprint allows for easy access to all console surface functions. Ethernet and Fibre Optic connections simplify installation as I/O connects directly to the console frame through four MADI I/O ports. SSLs Alpha-Link Live and Alpha-Link 8RMP rack I/O units provide low cost Mic amp, line level and digital audio connectivity and audio conversion. The console additionally integrates directly with SSLs MORSE resource sharing technology for multi-studio facilities. The ergonomic design and intuitive interface enables fast and simple setup with instant recall for presets and automation modes, and powerful routing options including One Touch Mix Minus functions. Master channel controls provide rapid hands-on access to all channel controls. The new Compact C10 HD also delivers comprehensive GPI control, redundant PSU operation and offers 24-channel analogue I/O, 24 AES/EBU I/O, eight sample rate converters, and eight SSL Mic Pres. The C10 HD is compatible with broadcast standard, multi-format monitoring with dedicated hardware controls. Simple fast setup with instant recall for Presets, Automation Mode etc. The new 16 fader C10 HD will be available from June 2010.